The "Quest Helpers Clan" is founded by The Draziw and Soiled Dove. Draziw disbands the "Quest Helpers Clan" as Soiled Dave becomes increasingly inactive on RuneScape. Draziw begins working on creating a new clan with his friends Kappathegray and Sethron 666. 9th: Clan Quest is officially founded by Draziw, Kappathegray, and Sethron 666. 9th: Draziw acts as the first de facto leader of Clan Quest, effectively becoming the first "Head of High Council". 10th: Clan Quest officially opens for enrollment, pulling members from the old "Quest Helpers" clan. 1st: Clan Quest submits for Jagex recognition. 8th: Clan Quest is recognized as an official clan by Jagex. Draziw and Sethron get mock-married in RuneScape, one of the first major events of the clans history. Clan Quest passes 40 members, showing a rapid growth for its relative youth. 15th: The first official Clan Quest Constitution is ratified. The "Low Council" is implemented, giving the clans "Captains" moderator powers within the clan chat. The original Low Councillors are ChaDMcBaDD, GL im Kody, HeyBullFrog, and Wsx. ChaDMcBaDD acts as the de jure leader of the new council. 7th: The first revisions are made to the Clan Constitution. 12th: The Clan Constitution is approved at a public council. Draziw becomes inactive, and so Kappathegrey assumes the role of "Head of High Council" in the clan. 8th: The first clan website, ClanQuest.darkbb, is launched by Early Hope. 12th: A vote is held to determine Clan Quests logo. Clan Quest reaches the milestone of at least 90 members. ChaDMcBaDD and GL im Kody are promoted to Generals/the High Council. Bigg Doggg becomes the leader of the Captains/Low Council. 20th: Draziw creates an official, but short-lived, Clan Quest wikia. 10th: ChaDMcBaDD and GL im Kody’s promotions to High Council are celebrated ingame. 1st: Wsx and Kontingency are retired from the Low Council. 15th: The Quest Fest is proposed. 26th: The official Clan Quest “Rune” logo is created by Anamona. She is granted the title “Mistress of Ceremonies”, and is guaranteed admission to the Low Council upon receiving her Quest Cape. 26th: The Quest List project, which saw The Rerecros attempting to complete every quest as quickly as possible, begins. 28th: The Clan Quest wikia is abandoned, but is recreated on the official RuneScape Clans Wiki. 3rd: Members of Clan Quest come together to practice for the Quest Fest, seeing as how they will be attending with multiple other questing clans. 6th: The first ever Quest Fest occurs. 9th: The Constitution is modified to allow the Low Council/Captains to accept new members applications. 7th: Clan Quest and Caped Carousers plan a regular Stealing Creation event together, demonstrating closer relations. 14th: ChadMcBadd and CupofChips have a huge fight in the clan chat, the first time a General/High Councillor has been involved in a public issue. 18th: Clan Quest and Caped Carousers start holding a weekly Stealing Creation event together. Members of Clan Quest start hosting huge events, marking the official origin of the Event Thugs United. 1st: Clan Quest holds its first “State of the Union” meeting in response to Chad and CupOfChips fight. The Honor Council is formed to handle situations like the one between Chad and CupOfChips. Hemsky becomes the first Head of Honor Council, with Nene Mom, Zumadragon, Early Hope, BomChica, and iQuestCape serving as assistants through his tenure. The Guardians, a secretive group given the power to choose who is allowed into the clan, are formed to “screen” prospective members. 1st: Sinistral is added to the Low Council. 3rd: A Clan Quest Ventrillo server is established by Panda in luv, the first ever clan voice chat platform. 4th: 12 users are recorded on the Clanquest.darkbb site at once, the most ever at one time, showing a growth in website activity. 4th: Clan Quest appears on the official Jagex-made Clan Submissions page. 6th: Rerecros completes the “Legends Quest”, the Event Thugs United hosts an afterparty with around 110 attendees. 11th: The Church of Brassica Prime is founded by Rerecros, beginning Clan Quests worship of the cabbage deity. 11th: Clan Quest and the Knights of the Abyss clan form an alliance, and begin hosting events together. 12th: The Clan celebrates several members completion of the "Nomad's Requiem" quest, including Anamona, who receives her Quest Cape and position in the Low Council. 31st: The “Parade of Unparalleled Noobness”/PUN/Indian Run occurs, with approximately 40 participants attending. 8th: The “Wecome back Kitty” event is held by the Event Thugs, welcoming clan-favorite Quest Kitty back to game activity. 17th: Clan Quest murders the King Black Dragon, a lot, in an event hosted by the Event Thugs. 24th: An impromptu birthday event is held for Rerecros, resulting in a massive cabbage bombing. 26th: Artson is promoted to High Council from the Low Council. The requirements to join the Low Council are changed to give the Low Council itself more power to add new members. The Honor Council is added to the Constitution, making it an official branch of the clans government. 2nd: The Canon of Ethics is ratified into the Constitution, setting ethical guidelines which the Honor Council shall enforce. 10th: The "Diary of Questers" clan is formed by a group of Clan Quest members who split off. 17th: GL im Kody is removed from the clan and the High Council for botting in RuneScape. 19th: Rerecros becomes a forum moderator. 6th: HeyBullFrog is banned from the clan after claiming to be able to hack several members through the offsite. 6th: Clan Quest plays several friendly games of Soul Wars with Knights of the Abyss. 9th: Clan Quest celebrates its first birthday, with 160+ reported attendees. 30th: Sk8r Dan Man is added to the Low Council. 8th: Draz’s birthday is celebrated ingame, an event organized by the Event Thugs. 18th: Discussion begins to update and modernize the clan website, a project led by Tohtli. 30th: The “Joy Spreaders” role is officialized. 30th: Vodka B becomes a forum moderator. 4th: “The event to end all events (for the year)” occurs, with over 200 participants. Featured an indian run, house party, cabbager hunt, and more. 9th: The weekly Tears of Guthix Event begins, hosted by Ragulu. Discussion begins to change the clan rules to modify the “No profanity” line. Discussion begins on forming a “Clan army”. 27th: Hemsky is retired as the Head of Honor Council due to inactivity, and so a new vote begins. The Diary of Questers clan disbands and remerges with Clan Quest. 1st: NeNe Mom is elected to be the new Head of Honor Council. 5th: The clanquest.org website is officially launched, leaving the darkbb site behind. 9th: Roting Mortal and Auridan become NeNe Mom's Honor Council assistants. 23rd: Scooty, Seraphangel, and Windegorn are retired from the Low Council. 28th: Jeroenvt is added to the Low Council. 5th: Ragulu resigns from the Low Council. 16th: Clan Quest is featured during the RuneScape Clan Month. 18th: Earth is promoted to the Low Council. Clan Quest is the Jagex featured clan for five days, the only one to be featured for more than three. Clan Quest grows to 190+ members following being featured in clan month. 12th: RuneScape releases the Clan Camp, which creates an official organization for ingame clans. 13th: Auridan is promoted to the Low Council. 16th: Announcements from a clan meeting. Anamona and Bigg Doggg are promoted to the High Council. Sinistral is promoted to Head of Low Council, succeeding Bigg Doggg. Spaded Ten, Its Drama, Vss, and Sir Macsimus are promoted to the Low Council. Nene Mom resigns from the position of Head of Honor Council. Skills2Quest becomes the new Head of Honor Council. 18th: The Clan Quest Charter is proposed to replace the Constitution. 19th: Jedi Bom and PureUranium become the Honor Council Assistants. 21st: A former member, now in the clan “Thunder in the Sky”, declares “War” on Clan Quest. The declaration is ignored by clan leadership, who handle the situation outside the clans jurisdiction. 30th: Zumadragon is added to the Low Council. Clan Quest begins regularly hosting “Penguin Hide and Seek” events. Clan Quests' roster falls to 137 due to new 1-clan system implemented with the clan camp. 10th: Ranks are shifted due to the Clan Camp update: “Captains” become “Generals”, while “Generals” become “Administrators”. 11th: Non-Low Council administrators, such as the website moderators and joy spreaders, are consolidated into the Low Council. 14th: Vodka B, Rerecros, MsKonnan, Sir Ragnhild, Edge Hybrid, and are promoted to the Low Council. 27th: Avaricious is promoted to the Low Council. 29th: Lady Klaw and Roadmaps become the Honor Council Assistants, replacing Jedi Bom and PureUranium. 2nd: The ETU resumes its weekly Stealing Creation games. 11th: The original “RAWR”(Random Act of Wicked Randomness) event is implemented by Sir Ragnhild, featuring randomly selected ingame events. 18th: Recruitment is closed due to overly rapid growth, and the Councils begin reowkring the overall recruitment process. 26th: Clan Citadels are released. 28th: Sinistral resigns from the Low Council, and his position as its leader, and nominates Earth to replace him. 28th: Sir Ragnhild resigns from the Low Council. 29th: The new Charter is accepted by both the High and Low Councils. Inactive members of the government are retired. Sir Macsimus, Spaded Ten, Its Drama, Edge Hybrid, Early Hope, Koretek, Dawnoffrost. 4th: The Guardians are temporarily disbanded, and the groups membership is wiped. 6th: Karen Angel hosts Clan Quests first “Open Mic Night” joke competition. 7th: Jeroenvt resigns from the Low Council. 11th: Borizi and Blarmy are added to the Low Council. 16th: Earth becomes the Head of Low Council. 18th: The sixth recruitment thread is drafted. 18th: Using the term “Generals” to officially describe the Low Council ends. 31st: Clan Quest is featured by Jagex yet again, making it the only clan to be featured on the clans wiki, Jagex blogs, and during the clan month. The revamped weekly Stealing Creation event ends due to inter-clan differences. 2nd: The Recruitment Razzers are formed. 2nd: The clan Youtube channel is created by ZarosReturnz. 3rd: The first ever unofficial clan Teamspeak is established by Seth E Roth. 5th: The “Adopt a Noob Foundation” project is initially proposed. It ultimately doesn’t go anywhere. 11th: The first ever "Low Council Policy" is created by Draziw. 15th: "State of the Clan" Address. Recruitment reopens after having been closed since July 18th. 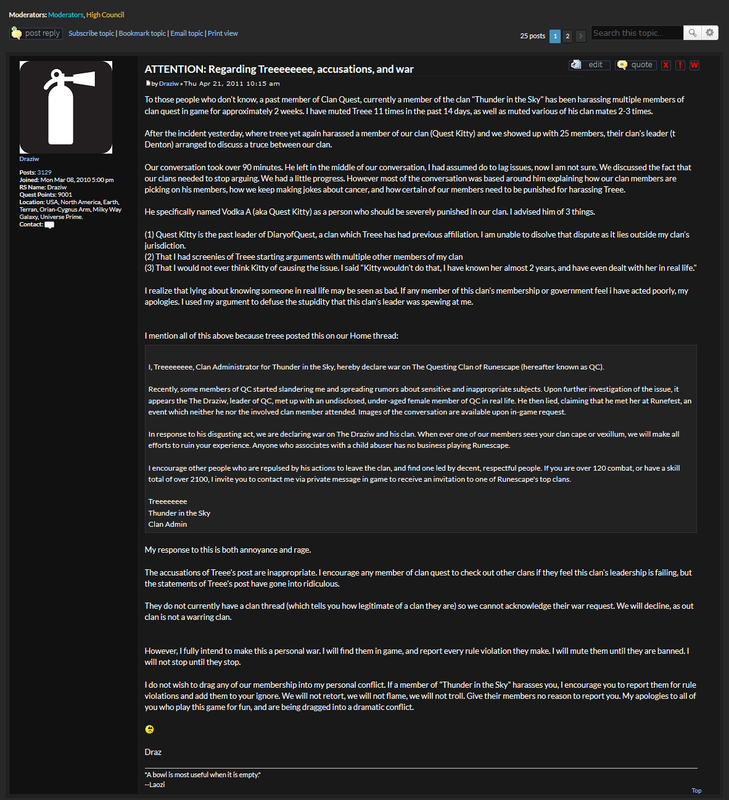 The Event Thugs are legitimized on the clan website with the addition of their own subforum. The Recruitment Razzers are officialized, and are led by MsKonnan10 and Lizbeth. 15th: Mock Turtle is added to the Low Council. 15th: The “Questaholic Magazine” is proposed by Daviddts. 18th: The sixth recruitment thread is posted. 18th: User:Jamie k1990 becomes the head of the Razzers. 9th: After initially forgetting about it, Clan Quest celebrates its second birthday. 9th: The Guardians are reimplemented with a new group. 27th: Tohtli is promoted to the High Council. Secret Santa 2011 is hosted by Vodka B. 4th: The Corporal Beast is noobed to death, again. 11th: The second joke competition is hosted by Karen Angel. Ytse and DivineSwine host a large-scale skilling competition throughout the month. 1st: The first issue of the Questaholic Magazine is posted by MsKonnan. 1st: Borizi becomes the editor of the Questaholic Magazine. 2nd: The Magazine forum is created to help the Magazine team coordinate. 4th: Karen Angel is promoted to the Low Council. 5th: The clan begins submitting suggestions for the name of their future clan dragon. Sir Chandis Troi suggests the name “Nogard”. 25th: The vote ends, and the clan's future dragon is officially named "Nogard". 29th: Ytse is promoted to the Low Council. 10th: Karen Angel hosts a RuneScape checkers tournament, which is won by Supmyninja. 2nd: A series of stories are published in the clan Magazine chronicling the fictitious life of the clan dragon, Nogard. AlphaLeo and A Loud Guy host the “Spot the Noob” event throughout the month. Clan Quests clan citadel in RuneScape reaches its highest level, tier 7. The clan votes to determine that "Nogard" will be a frost dragon, in line with the clans cyan color scheme. 6th: Earth becomes inactive, so MsKonnan is appointed the new Head of Low Council. 6th: Poorman30 is promoted to the Low Council. 6th: Jamie K1990 is promoted to the Low Council. 6th: Lebyh is promoted to the Low Council. 6th: A zombie outbreak infects the clan Citadel, in an event hosted by Ytse. 17th: Clan Quest’s own Vodka B stars in the Jagex sponsored “RuneCast” series. 25th: Ytse and AlphaLeo host a bracketed Skilling competition that runs into June. 29th: Clan Quest’s seventh recruitment thread is posted. Cireon is added to the Honor Council, making him its fourth member due to the groups general inactivity. 19th: Clan Quest partakes in the official RuneScape Clan Cup, which runs through July. 2nd: Chapu is promoted to the Low Council. 11th: Supmyninja is promoted to the Low Council. 16th: “The Wild Run” event is held. 23rd: Recruitment is closed so that the minimum requirements to join can be increased. 29th: The third annual Quest Fest is held. Recruitment is reopened after having been closed on July 23, complete with a restructuring of the ingame ranks. 13th: Mock Turtle resigns from the Low Council. 15th: Zacki is promoted to the Low Council. 19th: Dirty Rain is promoted to the Low Council. 24th: A Loud Guy is promoted to the Low Council. 24th: The “Skilling and Killing Competition” begins, an event hosted by Ytse. The “Just for Pun” competition is held. 6th: Clan Quest unlocks the citadel dragon, finally welcoming Nogard into the clan. 21st: A clan meeting is held ingame. MsKonnan10 and Skills2Quest are promoted to the High Council. The election process to select a new Head of Honor Council begins, due to Skills' promotion. Ytse is appointed as the new Head of Low Council. 28th: A new ranking system is implemented with a focus on clan fealty. The hope is to encourage and reward participation in the clan citadel. 30th: The “Ambassadors of Awesome” are formed by Ytse in an attempt to form better relations between CQ and other allied clans. The original Recruitment Razzers policy is implemented by Jamie K1990. Some controversy arises surrounding Roadmaps' campaign for Head of Honor Council, with some claiming that he harassed members for votes. 9th: Dirty Rain is elected as the Head of Honor Council. 9th: Clan Quest celebrates its third birthday. 10th: Cat Fud and AlphaLeo become Honor Council assistants. MsKonnan hosts the official 2012 "Secret Santa" event. 2nd: Following a successful clan "auction", the Clan Quest “Budget” is formally established. 12th: Andrew Cinqo is promoted to the Low Council. 23rd: The “Clan Quest Christmas Party” is held, during which the "Secret Santa" event is formally performed. Artson retires from the High Council. A push is made to recruit more members for the Recruitment Razzers. 17th: The short-lived “Quest Helpers” group is implemented. 23rd: Miss Alaska is promoted to the Low Council. 11th: Wolfie is promoted to the Low Council. 20th: The once regular “Penguin Hide and Seek” event unofficially ends. 3rd: A new Charter amendment is approved to update the Low Council promotion procedures. 10th: The first ever forum “Board Game”, “Warscape”, is hosted by AlphaLeo. 14th: Gardenchick is promoted to the Low Council. 17th: The second Low Council policy is created. 18th: Dirty Rain resigns from Honor and Low Councils. 27th: Cireon is promoted to the Low Council. 28th: The “Skilling and Killing” competition is put on permanent hiatus. 15th: AlphaLeo is elected as the new Head of Honor Council. 17th: CatFud and Infinity4 become the Honor Council assistants. 5th: The first “Warscape” game ends. 11th: The second game of “Warscape” begins. 14th: Rerecros attempts to revive the “Adopt a Noob Foundation”. 23rd: The second game of “Warscape” ends. The second “Clan Auction” occurs, this time with several other clans in attendance. 13th: Hemsky is promoted to the Low Council. 29th: Wolfie resigns from the Low Council. 30th: Infinity4 is promoted to the Low Council. 10th: The Fellowship of Clans is founded by Ytse. 20th: Ytse resigns from the Low Council, surrendering his position as its leader. Lizbeth briefly resigns from the Low Council, whether by accident or by intent. 1st: Sirapyro is promoted to the Low Council. 1st: Cireon becomes the new Head of Low Council. 9th: Lizbeth is (re)added to the Low Council. 9th: Lizbeth and Miss Alaska becomes the leaders of the Recruitment Razzers in place of Jamie K1990. MsKonnan becomes the Head of High Council, succeeding Draziw. 18th: Infinity4 resigns from the Guild(and Low/Honor Councils), but soon after rescinds his resignation. 20th: The first ever “Plant your Vex” screenshot competition is held by Cireon. A proposition is made to modify the charter to prevent Honor Councilors from serving in the Low Council. The conclusion is reached that they may freely serve in both. 6th: AlphaLeo is promoted to the Low Council. 9th: Clan Quest celebrates its fourth birthday. 30th: The first “Plant your Vex” screenshot competition ends. Clan Quest partakes in the Jagex sponsored “15 Days of Christmas” competition, an effort led by Miss Alaska. It runs into January. 29th: Skills2Quest resigns from the High Council. The fellowship of clans collapses. 1st: The third Low Council policy is implemented. Clan Quest wins the “caption this image” contest of the 15 days of Christmas competition. 4th: The Clan Quest pantomime is posted as part of the ongoing Christmas competition. 4th: Clan Quest scores second overall in the 15 days of Christmas competition. The recruitment system is overhauled, removing the need for sponsors. Ranks are adjusted to represent quests completed, removing the any influence of fealty. 2nd: The eighth Clan Quest recruitment thread is posted. 13th: Bigg Doggg resigns from the High Council. 19th: Clan Quest is added to the official tip.it list of clans. 17th: Anamona resigns from the High Council. 20th: Gardenchick replaces CatFud on the Honor Council. 4th: The Razzers Guidelines are updated. 6th: Santa Ends is promoted to the Low Council. 26th: A Loud Guy resigns from the Low Council. 1st: Nicole Angel is promoted to the Low Council. 12th: Viperxk is promoted to the Low Council. 21st: It is announced that Cireon, Earth, Lizbeth, and Hemsky will be promoted to the High Council. 3rd: Infinity4 resigns from the Low and Honor Councils. 10th: Cireon, Earth, Lizbeth, and Hemsky are officially promoted to the High Council. Cireon resigns as the Head of Low Council. 15th: Lady Klaw is promoted to the Low Council. 15th: Coopya is promoted to the Low Council. 7th-15th: The ingame clan chat is locked to guests, but is later reopened after significant pushback from the membership-at-large. 12th: Miss Alaska becomes the Head of Low Council. 13th: Clan Quest forms an alliance with the RSBandB fansite. 17th: Seb is added to the Honor Council to replace Infinity. 21st: The Combat Marshals are formed. The long running weekly "Tears of Guthix" event ends. 28th: The “Warscape” game is revived by Andrew Cinqo, marking the beginning of the third game. 2nd: ILikeSlayer becomes the temporary Editor of the Questaholic Magazine. 10th: Clan Quest reaches 300 members in RuneScape. 19th: Iskh is promoted to the Low Council. 23rd: Changes to the wording of the charter are ratified. 3rd: “The Noob Wars”, a more intricate version of “Warscape”, begins, hosted by Seb. 28th: The third “Warscape” game is cancelled. 9th: ILikeSlayer is promoted to the Low Council. 17th: Seb is promoted to the Low Council. 28th: Addicted Des is promoted to the Low Coluncil. 28th: Whiggy is promoted to the Low Council. 8th: The official Jagex Quest Cup begins. 12th: Codelyoko252 is promoted to the Low Council. 13th: Blarmy resigns from the Low Council. 14th: The Quest Cup ends. 17th: Sinistral is re-added to the Low Council. 17th: The Combat Marshals subforum is created. 21st: A general clan meeting is held. Cireon, Hemsky, Lizbeth, and Earth are officially welcomed to the High Council. 21st: Meru is promoted to the Low Council. 22nd: xoxSCOTTYxox is promoted to the Low Council. The “Noob Wars” game ends. 16th: Simbakuro is promoted to the Low Council. 21st: The Quest Cup results are published, and Clan Quest is revealed to have placed in the top ten. 25th: Changes are made to the Low Council promotion policy to include a “Bronze quest”. 26th: Coopya resigns from the Low Council. 10th: Cireon becomes the Head of High Council. 9th: Clan Quest celebrates its fifth anniversary. 21st: The fourth Low Council policy is implemented. Vodka B hosts the annual Secret Santa event. 12th: The ninth recruitment thread is posted. 14th: Protoman807 is promoted to the Low Council. 1st: The Questaholic magazine ceases its monthly publication, and is effectively ended. 30th: R3Y is promoted to the Low Council. 2nd: GooberLee is promoted to the Low Council. 3rd: DrakanHpS is promoted to the Low Council. 4th: Kfoster3 is promoted to the Low Council. 8th: Pacrat4 is promoted to the Low Council. 13th: Chapu resigns from the Low Council. 22nd: Quest Kitty is promoted to the Low Council. The low Council promotion procedure is changed to include more anonymity and clearer voting thresholds. 14th: Miss Alaska resigns as the Head of Low Council. 18th: Clan Quest reaches 400 members in RuneScape. 29th: An ingame clan meeting is held. 31st: Sirapyro becomes the Head of Low Council. 8th: Quest Kitty becomes a forum moderator. 27th: Sirapyro becomes a forum moderator. 28th: The fifth Low Council policy is implemented. 7th: An official Clan Quest Steam group is created. 27th: Kitty Aether is promoted to the Low Council. Kitty replaces Gardenchick on the Honor Council. 5th: Clan Quest creates a Mumble voice chat server. 5th: R3Y resigns from the Low Council. 17th: The “Skill of the Week” competition is started by Magicking. 27th: The first ever game of “Clan Quest Monopoly” begins, hosted by Sirapyro. Attempts are made to create a Clan Quest created RuneScape "lore bible", but it ultimately does not pan out. 1st: The second game of “Forum Monopoly” begins. 8th: AlphaLeo resigns from the Honor Council. 8th: Wolffi becomes the new Head of the Razzers. 13th: Santa Ends revives a portion of the Magazine by continuing the clan member interviews. 19th: The forum board game “Betrayal at House on the Hill” is hosted by Wolffi. 31st: Seb is elected as the Head of Honor Council. 3rd: Shane and Kitty are appointed as the new Honor Councillors. 6th: “Betrayal at House on the Hill” is left unfinished. 13th: Kitty Aether resigns from the Low Council. 11th: Viperxk resigns from the Low Council. 15th: The first “Forum Monopoly” game ends. 16th: The second “Forum Monopoly” game is cancelled due to a harddrive crash. 23rd: The “Skill of the Week” competitions are cancelled. 30th: An unofficial Teamspeak server is created, and there is debate on whether or not it should replace the clan Mumble server. 2nd: Irene Angel becomes the Head of the Razzers. 3rd: Several members of Clan Quest attend RuneFest. 13th: Irene Angel is promoted to the Low Council. Recruitment will close on November 11th so that the recruitment process can be modified. The offsite revamp project begins. Mell, Stick Man H, Saiyan Eric, Mizu Katana, and Linkvi are promoted to the Low Council. The Magazine posts its first full relaunched issue. The annual secret santa event is hosted by Soul Quester and CoolBanksy. 26th: The tenth recruitment thread is drafted. 11th: The official monthly clan raffle begins. 16th: Santa Ends hosts another, smaller, clanmember auction. 20th: The recruitment process is overhauled to reimplement the sponsors system and the guardians. 25th: Ranks are reworked to adjust the council positions and acknowledge the master quest cape. 25th: The “Admin” rank is made accessible to general members so that they may take out the Avatar. ChaDMcBaDD is retired from the High Council. 26th: Lizbeth retires from the High Council. 13th: The tenth recruitment thread goes live. 13th: Thaxy is promoted to the Low Council. 18th: Recruitment is reopened after having been closed on November 11. 23rd: Lebyh resigns from the Low Council. 22nd: The official Clan Quest Discord is created, acting as the single official voice chat platform for Clan Quest. 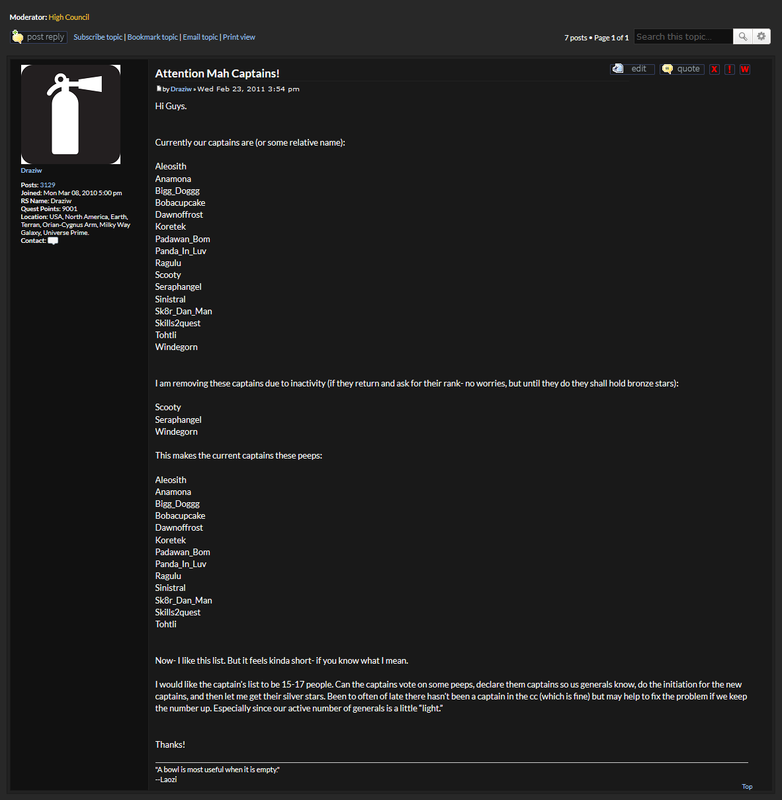 1st: The “Forum Monopoly” game is revived by Sirapyro. 20th: Addicted Des resigns from the Low Council. 7th: Tyco Elf is promoted to the Low Council. 13th: The third “Forum Monopoly” game ends. 31st: The fourth “Forum Monopoly” game begins. 17th: Several members of Clan Quest attend RuneFest. 18th: The “Warscape” forum game is revived by Sirapyro. 26th: The fourth game of “Forum Monopoly” ends. 27th: The fifth game of “Forum Monopoly” begins. 16th: Sinistral resigns from the Low Council. 30th: The official clan raffle ends. 2nd: The Low Council Handbook is implemented, replacing Low Council policy and simplifying the promotion procedure. 9th: Clan Quest celebrates its seventh birthday. 16th: Choto 3000 is promoted to the Low Council. 26th: Xenon Ray is promoted to the Low Council. CoolBanksy hosts the annual “Secret Santa”. 24th: The fourth game of “Warscape” ends. 27th: The fifth game of “Forum Monopoly” ends. 28th: Weekly Vindicta bossing events begin, hosted by Xenon Ray. 1st: The sixth game of “Forum Monopoly” begins, now hosted by Shane. 4th: Several inactive members of the Low Council are retired. Panda in Luv, Auridan, Sk8r Dan Man, Bobacupcake, Aleosith, Vss, Simbakuro, Jamie K1990, Zacki, Poorman30, Andrew Cinqo, Meru, GooberLee, Codelyoko252. 13th: The sixth “Forum Monopoly” game ends. FieldsOfHope hosts the “Valentine’s Day raffle”. 5th: CoolBanksy hosts the clans first “Cards Against Humanity” event, setting a precedent for non-Runescape events. 3rd: “Clan Quest War” a game similar to “Warscape”, begins, hosted by Sirapyro. 12th: Attempts begin to create a “Clan Quest Coin”. 18th: Attempts are made to apply the offsite revamp, but technical difficulties force them to be postponed. 4th: Sirapyro is promoted to High Council, and consequentially resigns from the position as the Head of Low Council. 9th: Tyco Elf becomes the Head of Low Council. 15th: The “Clan Quest War” game ends. 15th: Shane is added to the Low Council. 15th: The seventh game of “Forum Monopoly” begins, again hosted by Shane. 10th: Mizu Arashi resigns from the Low Council. 18th: The first phase of the offsite revamp rolls out, updating the websites home page and overall look. It also introduces a new official clan logo and branding. 25th: The weekly Vindicta bossing event ends. 30th: The 2-year relaunch anniversary of Questaholic is celebrated with a special interview featuring interviews with Jagex Mod Raven and free-to-play icon Meneer Naab. 11th: Tyco Elf becomes a forum moderator. 17th: The seventh “Forum Monopoly” game ends. 23rd: The Biggest and Best Clan Quest Survey is held. 24th: The “Random Act of Win Reward” (RAWR) is reimplemented. 1st: An official policy is set to allow members to join with their secondary RS3 accounts using the offsite. 14th: Efforts begin to organize and present Clan Quests entire history in a neat “About Us” format, to better represent the clan and its groups, an effort led mostly by Sirapyro and Draziw. 19th: Xil Cam hosts the “Noob Freeforall” PK’er event. 20th: The clans usergroups are condensed and rebranded to look neater and more symbolic, in an effort to better represent them. The “Questaholic Editors” and "Offsite Revamp Team" groups become the “Content Editors”, a group in charge of the Magazine, video content, and other offsite content. The Combat Marshals becomes “The Marshals”, signifying their importance as not only the fighters of Clan Quest, but its guardians as well. 23rd: The RS3 Guild starts a public fund for its members to use during specialized skilling weekends. A draft of a brand new Clan Constitution begins. 1st: Clan Quest implements a Wiki system onto its website, allowing for more self controlled content. 23rd: 15+ members of Clan Quest attend Runefest together. 23rd: Questcaping and i herblaw are promoted to the Low Council in person at Runefest. 26th: The Clan Quest Twitter is revitalized. 26th: In a surge of reorganizations, the offsite forum order is reshuffled. 30th: The Clan Quest "C.O.R.E." series of events begins. 1st: Alex 43 is promoted to the Low Council. 26th: Five members of Clan Quest qualify for the finals of the RuneScape "Dimension of the Damned" finale: Tyco elf, Xenon Ray, Xil-Cam, Cyan R, and Sebbage. 9th: Clan Quest celebrates its eighth birhday. 10th: A milestone of 100,000 total lifetime posts is made on the Clan Quest official forums. 28th: The official "Event Calendar" is released. 4th: Questcaping wins a Jagex-sponsored writing competition and receives a free trip to Jagex, bringing along fellow member TheRedLady. With clan shirts in hand, it is even further cemented into Jagex's memory. 10th: The annual Secret Santa event is hosted by Tyco Elf. 24th: Toragrai is promoted to the Low Council. 22nd: The eighth game of forum Monopoly begins. 1st: The Wiki is soft launched in the monthly Clan bulletin. 1st: Tyco elf hosts the "March raffle"
Inactive Low Councilors are not added to the Guild Council and are retired. They included Rerecros, Lady Klaw, Borizi, Avaricious, AlphaLeo, Pacrat4, Miss Alaska, Nicole Angel, Gardenchick, linkvi, kfoster3, Whiggy, Stick Man H, Irene Angel, Mell, DrakanHpS, xoxSCOTTYxox, and Chaotic Eric. 13th: The Discord and Forum moderators are combined and synced between both platforms. 21st: The Razzers and ETU Offsite and Discord groups are disbanded. 22nd: Questcaping, PTV Suli, Wolffi, and Nex Sicarium are announced as the RS3 Honor Council assistants. 22nd: RS3 Recruitment is closed to rework the processes following the Constitution launch. 24th: The eighth game of forum Monopoly ends. 31st: The Questing Clan of RuneScape performs its first major culling, removing thirty long inactive members of the Guild to free up space. 29th: Clan Discord policy is changed to give individual Guilds the ability to determine their own guest access. 1st: As announced in the monthly bulletin, the Questing Clan of RuneScape changes its policy on membership and allows for ingame guests to earn official membership, even without being invited ingame. 27th: An application for the "Old School Clan Quest" guild is posted by Roadsick. 1st: Vodka B resigns from the RS3 Guild Council. 1st: The second Questaholic relaunch anniversary issue is released. 1st: The vote for the "Old School Clan Quest" Guild officially begins. 8th: The "Old School Clan Quest" Guild is officially accepted as Clan Quest's second Guild. Roadsick becomes the first Head of OSRS Guild Council. Irene Angel, Ragulu, Santa Ends, and The Sugam become the Guild Councilors. Santa Ends becomes the first Head of OSRS Honor Council. 25th: Choto 3000 becomes a Forum Moderator. 30th: The RS3 Clan system is updated. Avatar wardens are removed, and the Guild Council is given additional management tools. 1st: The Biggest and Best Clan Quest Survey 2018 edition is launched. 2nd: Ozazoyo is added to the OSRS Guild Council. 8th: Discord groups are added to help reach more people for events/announcements. 28th: Derparnieux resigns as the Head of RS3 Honor Council due to the groups inactivity. 28th: A new election begins for the RS3 Head of Honor Council. 1st: The RS3 Guild Council begins a "Task board" initiative to help its less active members contribute. 6th: Derparnieux is reelected as the Head of Honor Council. 17th: Choto 3000 is added to the OSRS Guild Council. On the same day, he is appointed as Head of said Council. 26th: Tyco Elf begins a "check of interest" for a "Clan Quest Summer Vacation", a real life meetup between members of the Clan hosted in his own home country of Sweden. 28th: Quester Rob is added to the OSRS Guild Council. 9th: Old School Clan Quest surpasses 50 members, and a new election begins for Head of Honor Council. ↑ GENERALS AND CAPTAINS! TAKE NOTICE! ↑ We Have Recieved a Challenge! ↑ a vent for clan quest!! ↑ This day in clan history! ↑ We're in this month's Clan Submission page!!! ↑ Draz!!! Do Not Look!!! ↑ THE TEARS OF GUTHIX WEEKLY EVENT! ↑ The Minutes of the Meeting! ↑ How shall we write the rules? ↑ Shall we make a clan army? ↑ 56.0 56.1 WHO SHALL LEAD OUR HONOR COUNCIL? ↑ The QC Penguin Hunt! ↑ 77.0 77.1 Weekly SC is back!!! ↑ Clan Quest's First Ever: OPEN MIC NIGHT!!! ↑ Congratz to Blarmy and Boricua! ↑ Renaming Dropping the name "Generals"
↑ GFD!!! We forgot the Clan Birthday!?!?!? ↑ Joke Competition !!! RESULTS !!!!! ↑ Clan Quest Skilling Tournament! ↑ Clan Quest Checkers Tournament!!! ↑ 125.0 125.1 125.2 Message from the new "head"
↑ The New Honor Council! ↑ Volunteer for Recruitment Razzers here! ↑ Hemsky is promoted to the Low Council. ↑ Clan Christmas Events - 15 Days of Christmas! ↑ Secret Santa - 2014 Edition! ↑ A New Recruitment Thread! ↑ Skill of The Week Competition! ↑ Clanmate Meeting - open to everyone! ↑ November 9th, 2015 Meeting Minutes! ↑ Clan Anniversary / Clan Meeting November - 9th, 2015! ↑ Discord now officially supported! ↑ Clan Quest Secret Santa and events. ↑ Your new Head of Low Council! ↑ Welcome to the new offsite! ↑ Toragrai is promoted to the Low Council. ↑ Nominations for new Head of Honor Council! ↑ Head of Guild Council? ↑ Happy Birthday Clan Quest - Contest Inside!